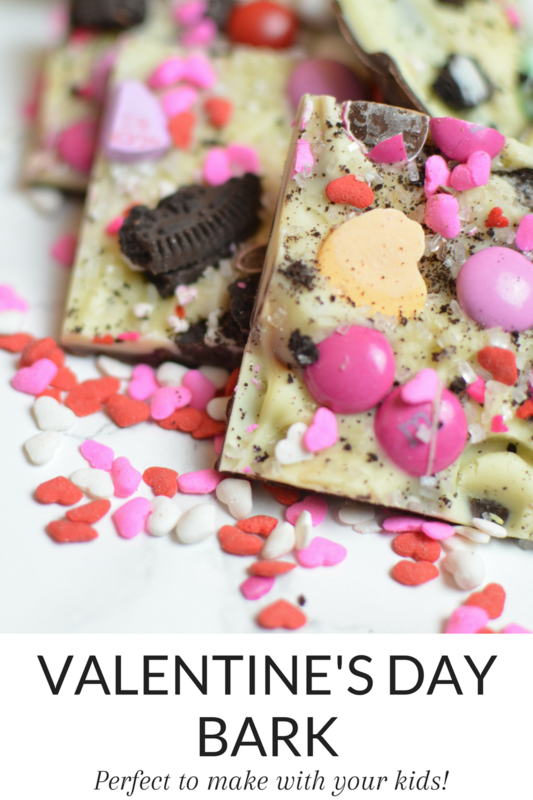 Easy Valentine's Day Bark - Perfect to Make with Your Kids! We may have just finished the holiday season, but the next one is just around the corner! 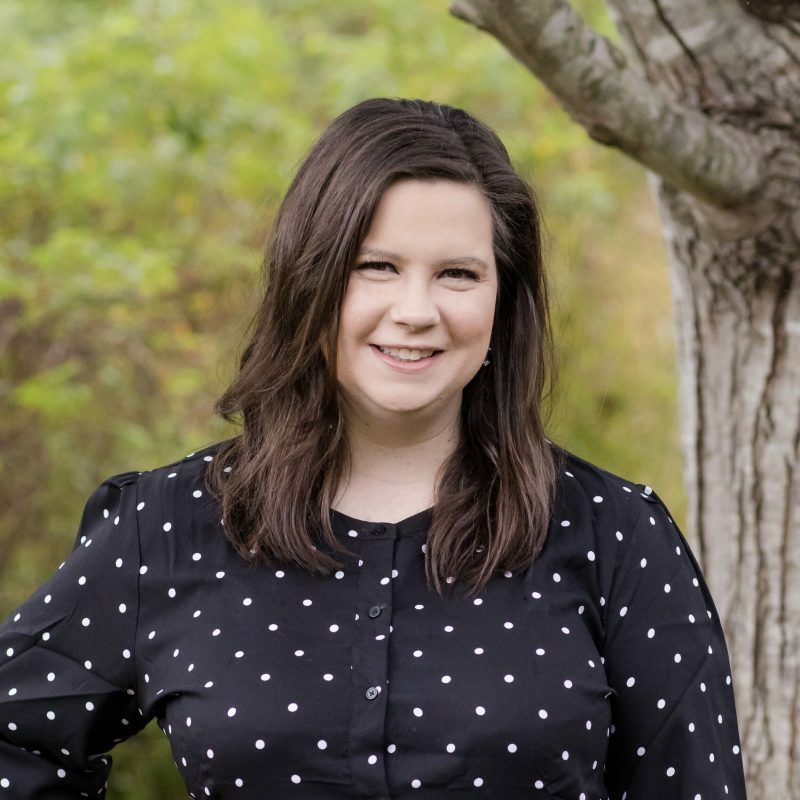 Valentine’s Day will be here before we know it, and I wanted to find a way to make it fun for Abbie now that she’s getting older and more interested in holidays. 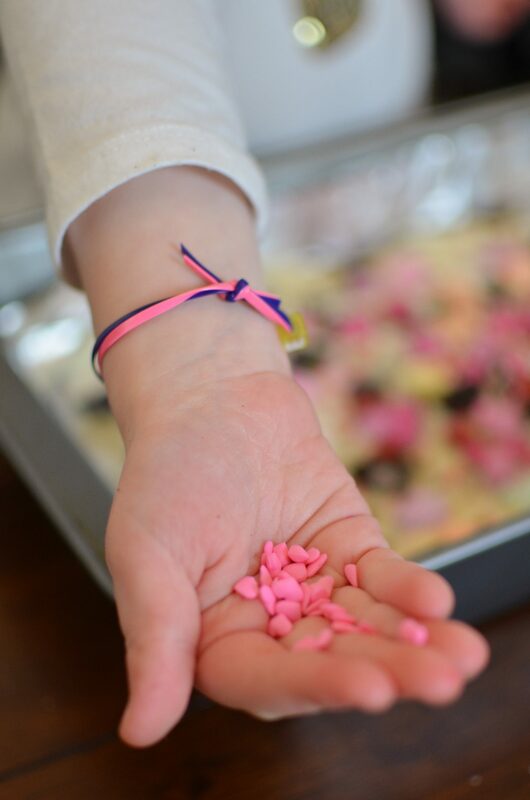 Valentine’s Day is so fun for kids – especially my 5-year-old who loves candy… and all things pink. One of my favorite easy treats to make is bark – of all kinds. It requires a microwave, chocolate, and toppings – my kind of recipe. I put together the chocolate part and let Abbie go to town on the toppings – with a little coaching on not putting them all in one place! This recipe is perfect for the kiddos in your life to help with the Valentine’s Day treats, and you could even make a party out of it by giving each of your kids their own pan to decorate! The perfect Valentine's Day treat to make with your kids! Line a 9 x 13 pan with nonstick foil. You could alternatively use parchment paper or wax paper, but I tend to prefer the nonstick foil. 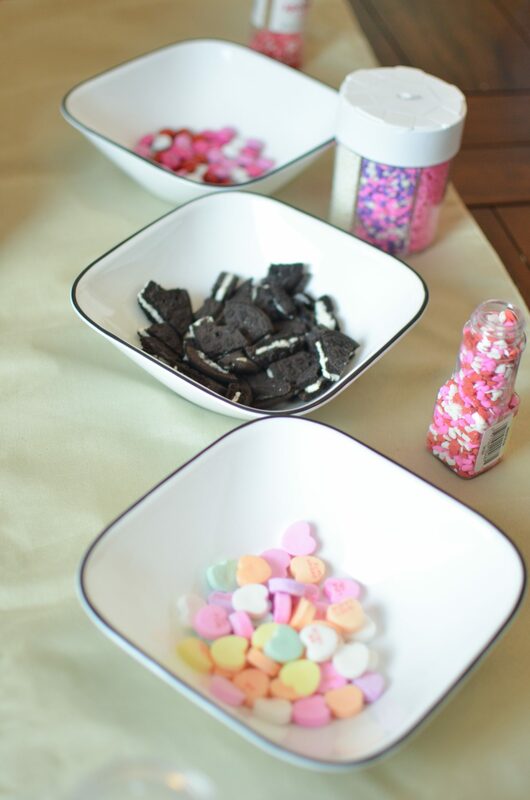 Make sure your toppings are ready to go - we used crushed sandwich cookies, conversation hearts, pink and red candies, and Valentine's Day sprinkles. In a medium bowl, break up the semi-sweet dark chocolate and add 1/2 tsp of coconut oil. Melt in the microwave in 30-second intervals, stirring each time. Be careful to stir often and not let it scorch! Once melted, add 1/4 tsp of the almond extract and stir well. Spread the chocolate evenly in the prepared pan. Place the pan in the fridge for about 12-15 minutes or the freezer for about 8 minutes. Meanwhile, break up and melt the white chocolate and 1/2 tsp coconut oil in the same way you did the semi-sweet. Stir in 1/4 tsp almond extract once melted and stir well. Get the pan out of the fridge or freezer. Working quickly so as not to melt the semi-sweet chocolate, spread the white chocolate over the semi-sweet in an even layer. You may get some swirling, but it'll still taste good! Before the chocolate hardens, add your toppings! This is where you get to have fun - spread them out over the chocolate and make it festive! 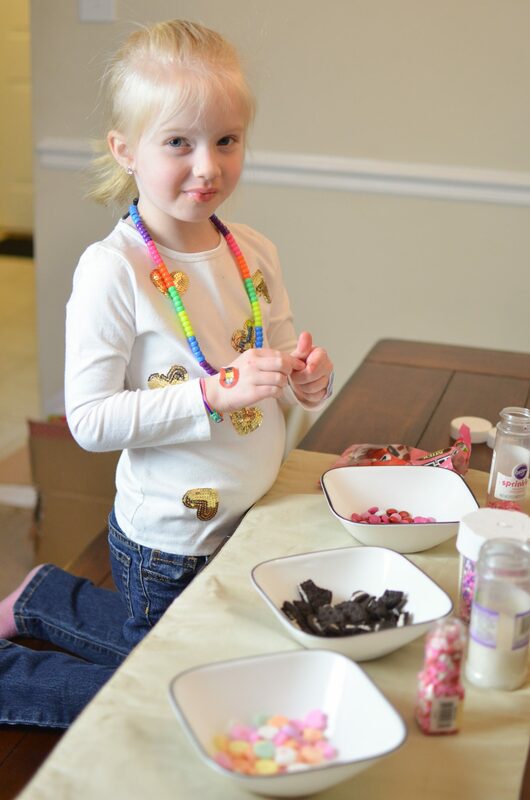 Will you be making Valentine’s Day treats with your little ones? What are your favorite things to make? Previous Post I Don’t Want My Daughters to Say #MeToo.